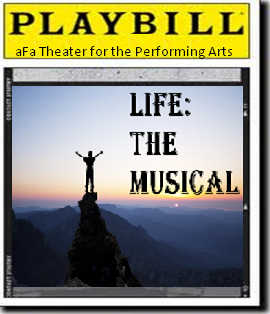 From birth to death, from young to old, from emotions to work and play, Life: The Musical has taken attendees through the journey of life. The 17 acts captured snippets of life, but as we know, life is so much more. Alisha (Abtwixt) submitted a song in Act 16 (Death) that sparked this epilogue. Although originally written for Lost (the TV show), the performing artist in this video recorded this with something personal in mind. He posted these words on his YouTube post. Yes, life is much to life, sometimes simple, other times complicated. Times full of joy, and testy, frustrating, and gut-wrenching. Many of you have songs in your heart about life .. the songs with lyrics that touch you personally. In that spirit, I invite you to post a song about life, and if you can, please share a short note of why your choice is important to you. Wishing you nothing but the best in your life … and thank you for being part of mine. Time marches on. Although one gets older with each day, one grows old … and then, whether expected or suddenly – the last breath is taken – life as we know it is over. Song titles for Act 16 must contain death, die, dies, died, dead, or dying in the title. The beautiful thing about music and all the arts is that people continue to enjoy the work even after the artist has died. We got to know this artist when as one of the four young lads from England during the early 1960s. Although two are gone, he’s here to sing Live and Let Die … we welcome Sir Paul McCartney and Wings! Time marches on. Although one gets older with each day, one grows old (that’s the theme) – so song titles need to include old, older, oldest, elderly, or aging. Two cautions: 1) My Old Kentucky Home is not permitted, and 2) titles as 12-Year-Old Boy will be nixed because the boy isn’t old. A rock legend opens Act 15, so saying his name is all that’s needed. Ladies and gentleman, singing Old Man, welcome Neil Young. There are different versions of this song, but we thought this jazz version is a great fit for starting this act. Ladies and gentleman, we welcome the dynamic Diana Krall with Cry Me a River. No matter the situation, human encounters also provide a wide-range of emotions – so Act 13 features songs with a positive emotion in the title … but because it was the Act 12 feature, love is not acceptable, and using tears will be scrutinized. Back in the early 1960s, they were part of the British Invasion and one of my favorite bands. Ladies and gentleman, a big aFa welcome to the Dave Clark Five with Glad All Over. Eventually, we move into adulthood as women and men with many things going on in our life. Whether its work, play, or family, life can be complicated, so many times we hope for the best. But one thing for certain – the vast majority of people want love. Act 12 features songs with love in the title. There is a bountiful list of possibilities to open Act 12 featuring love. Let go back to the 1985 with Robert Palmer … it’s Addicted to Love.